Eighties arcade phenomenon Dragon's Lair has been digitally restored and is to be re-released on Blu-ray disc. The Don Bluth classic becomes the first interactive BD-J (Blu-ray Disc Java) title to be released. Dragon's Lair, which was one of the very first laserdisc video games, featured polished cartoon-quality animations and was the first game to allow players to control a 'fully realised' character. Players would watch the hero, Dirk the daring, move through an elaborately booby-trapped castle on a Disney-esque quest to rescue the princess Daphne from the dragon Singe. But while its visuals were streets ahead of rival games (the vector graphic-based Star Wars arcade game was released in the same year), the downside of its sumptuous visuals was that the gameplay was reduced to a sequence of A, B or C choices. Consequently, Dragon's Lair was a game that players watched more than they played. At key moments, the cartoon animation would prompt the player to make a choice or quickly perform an action. Hit the right button, at the right time (to jump, duck, swing a sword, etc) and the game would show the appropriate outcome - Dirk either moved deeper into the castle or suffered a jokey cartoon demise. An instant hit in its 1983 arcade laserdisc debut, it has now been digitally restored and enhanced with an all-new 5.1 surround sound mix. "Digital Leisure, with authoring partner Infinite HD, transferred the video directly from the original film and painstakingly cleaned each frame by hand, creating a truly vibrant image," reads the press release we received today. The game has been authored in the BD-J environment, an advanced format that allows users to enjoy a fully arcade-authentic experience. Dragon's Lair is the first title to use this technology, and Digital Leisure hopes that it will set the standard for future interactive implementations of BD-J. All Blu-ray Disc players, including the Sony PlayStation 3, are designed to play BD-J titles based on the Blu-ray Disc Association specifications. "I've seen the newly restored footage and it just looks amazing," said Don Bluth, ex-Disney animator and original creator of Dragon's Lair. "It looks even better than I can remember. The visuals, the 5.1 surround sound audio, all I can say is 'wow!' Now a whole new generation can enjoy Dragon's Lair all over again." Digital Leisure plans to follow up Dragon's Lair Blu-ray with the release of the sequels Space Ace and Dragon's Lair II: Time Warp in the Blu-ray Java format. 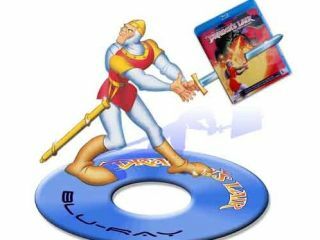 Dragon's Lair Blu-ray will be available on 9 April at many software and movie retailers as well as on an official website .